Plywood is highly resistant to many chemicals. It is effectively used in many industrial applications involving contact with chemicals, including dilute acids, alkalies, organic chemicals, and many neutral and acid salts, both hot and cold. Exterior glue lines are more chemically resistant to most acids and bases, solvents and petroleum than the wood. Plywood does, however, accept pressure treatments such as preservatives and fire-retardant solutions. OSB can be treated to resist biological attack with proprietary processes. Pressure treatment with preservative or fire-retardant solutions is highly effective for plywood. Plywood's cross-laminated structure provides pathways along the edges for materials to pass. This thoroughness of penetration means that plywood may be cut in the field, normally without loss of protection at cut edges. For extra protection, however, an additional field-applied treatment can be added to cut edges. With pressure-preservative treatment, most features of strength and physical properties are maintained, with additional preservative protection. These features are especially advantageous in the Permanent Wood Foundation system. 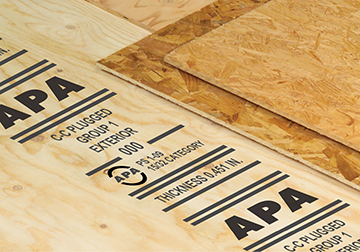 Plywood is highly resistant to many chemicals. It is effectively used in many industrial applications involving contact with chemicals, including dilute acids, alkalies, organic chemicals and many neutral and acid salts, both hot and cold. Exterior glue lines are more chemically resistant to most acids and bases, solvents and petroleum than the wood. Plywood has been successfully used in tanks and exhaust flues from various industrial processes. When the chemical reagent has a pH from above 2 to below 10, the weakening effect on plywood is minimal with moderate exposure at room temperature. Plywood tanks and containers exposed to chemical solutions can swell slightly, although the cross-laminated construction minimizes dimensional changes. This characteristic reduces the chance for joint failure and leakage. Plywood is sufficiently resistant to water and most mild chemical solutions, so unlined plywood tanks are used extensively. When additional resistance to chemicals is required, plywood with a rubber or polyvinyl chloride (PVC) liner provides a tank capable of holding nearly any type solution. Liquid-applied neoprene, and some chemical-resistant paints are also effective. Strong mineral acids (generally pH less than 2): Acid hydrolysis occurs, forming a quantity of mixed sugars. These treatments will essentially destroy the wood over a period of time. Concentrated nitric acid may cause ignition. Dilute mineral acids: Generally assumed to have little effect on wood when in contact with the surface. If the wood is impregnated with a solution of mineral acid, some reduction of strength will occur. Organic acids: Most organic acids (e.g., acetic, formic, oxalic) are expected to have little effect except in high concentrations. Dilute alkaline solutions: Dilute solutions will weaken wood, the rate being dependent upon temperature and alkalinity. Cold dilute alkali solutions will weaken wood at a very slow rate. Strong caustic solutions (pH greater than 10): Strong caustic solutions swell and weaken the wood. Salts: Although most common salts and salt solutions have no significant effect on wood, certain highly acidic or alkaline solutions may reduce its strength. Iron salts can also cause some loss in strength. Oil: Oil and gasoline have little or no effect on wood. High Density Overlaid plywood (HDO) is Exterior plywood overlaid with a hard, semiopaque resin-impregnated fiber surface. This overlaid surface provides the plywood with additional chemical resistance because the resin-impregnated overlay, like the glueline, is resistant to most mineral and organic acids. Another product, Medium Density Overlaid plywood (MDO) is also Exterior plywood with a resin-fiber overlay providing a smooth opaque surface ideal as a paint base. Medium Density Overlaid plywood is not as resistant as HDO, and is designed for applications where a liner or coating is to be added to the plywood surface. HDO has been used very successfully in resisting chemical agents. A printing company in Tacoma, Washington, uses HDO for etching tanks. The tanks have been in service continuously for over 20 years with no repairs required. In fact, the owner indicated that the plumbing has been replaced several times but the tanks have performed without a problem. In another case, HDO is used in exhaust ductwork from an industrial process. The sulfuric acid fumes (2 to 15 percent H2SO4) at 100° F and 100 percent relative humidity have been continuously carried by the plywood ductwork for over 13 years with little or no repair work required. One test determined chemical resistance to 33 different reagents by exposing the overlay to approximately 1 cc of each reagent for 24 hours at room temperature. The reagent was contained in a "holding dam" of melted paraffin wax approximately 2 inches in diameter, and a watch glass was placed over the reagent and dam to minimize evaporation. At end of test period, the remaining reagent was removed by blotting and the surface was thoroughly rinsed with tap water. Specimens were permitted to dry one hour at room temperature and were then examined for surface degradation. 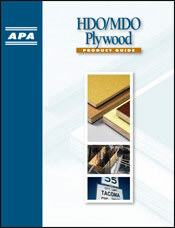 APA's Product Guide HDO/MDO Plywood, Form B360, contains a table with the effects of these reagents on HDO and MDO.